In the September 12th issue of Globe their cover story is ‘Cops Probe Obama’. Blazoned across the cover ‘Tough talking sheriff investigate phony birth certificate.’ Of course the sheriff has given all the info to Globe and the tabloid is also asking whether Obama will be impeached? There have been Obama conspiracy theories going on for a some time. In April the White House released a copy of President Obama‘s birth certificated because the President wanted to silence the rumors. He felt the continued speculation was not good for the country. 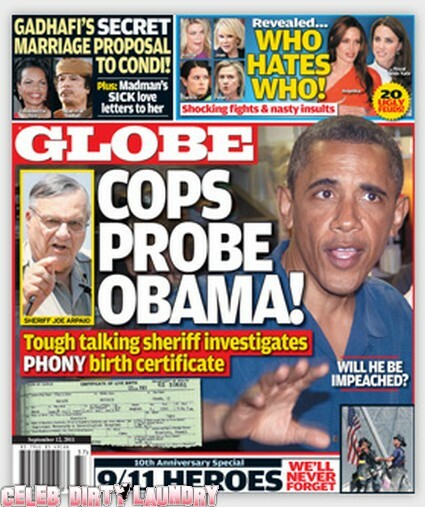 Globe claims: In a bombshell development, GLOBE has learned that President Obama is being investigated by top Arizona lawman Joe Arpaio on claims the birth certificate the White House released in April is a FAKE! Read why insiders say the President is in danger of being booted out of office – and even put on trial – in this week’s GLOBE. In my opinion this is just sensationalist created by Globe because campaigning for the 2012 presidency has commenced and they are dragging up this story again for salacious entertainment and profit. This is just wrong, shame on you Globe! Star Magazine: Christina, Kim, Jessica: 3 Weddings & A Baby!